On December 3, 2007, the Board of Regents of the University of Wisconsin System (the “University”) filed a trademark infringement lawsuit in the U.S. District Court for the Western District of Wisconsin against Washburn University in Topeka, Kansas (“Washburn”) . See Board of Regents of the University of Wisconsin System v. Washburn University, Case No. 3:2007cv00672 (W.D. Wis.). News stories about the lawsuit can be found here and here. 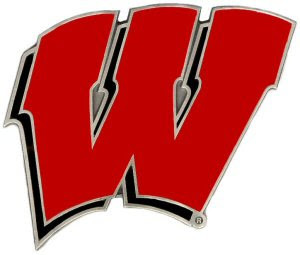 The complaint alleges that Washburn’s W logo (pictured above) infringes upon the University of Wisconsin at Madison’s (“UW-Madison’s”) “W” logo (pictured below). The University holds two registrations for the above “W” logo – one for clothing and another for education services (and color is not claimed as a feature of the mark). Both marks were registered in 1996, but first use is commerce is claimed back to September 1990. The University also has several registrations and pending applications for marks incorporating some variation of the “W” logo – most of which include UW-Madison’s official badger mascot, Buckingham U. Badger (“Bucky”). According to suit, representatives from UW-Madison have sent numerous cease and desist letters to Washburn over the past six years. UW-Madison licenses the use of its logo on clothing, glassware and other UW-Madison souvenirs and claims that Washburn’s use of its own logo on similar items may cause consumer confusion and cause harm to UW-Madison’s goodwill. In addition to injunctive relief, the lawsuit also seeks profits derived from Washburn’s use of the infringing mark, destruction of all merchandise displaying the infringing mark, and punitive damages. The University appears to have recently strengthened its efforts to police and enforce its trademark rights to its “W” logo. 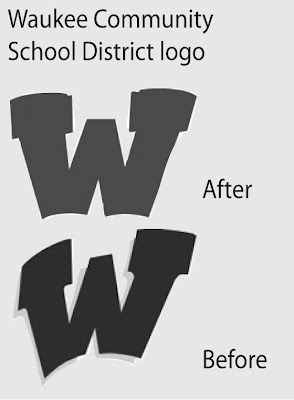 Back in March of this year, the Marquette Tribune ran an article (link here) about a cease and desist letter sent by the University to Waukee High School in Iowa because of the high school’s use of a similar looking “W” logo. The dispute ended amicably with the high school changing its logo (see below). Las Vegas Trademark Attorney is a great blog -- love it that you post the images you discuss. I wish you had some way to sign up for RSS or Feedblitz. Would love to know whenever you do a new post. Thank you!